Tamsui is located in the northwest of Taipei with Sanchih to the north, Guandu to the south, and Pali on the other side of the river. Tamsui is a vivid township with an enriched historical background. With beautiful ocean and mountain sceneries, Tamsui is the favorite visiting attraction closest to Taipei City. The name Tamsui originated from Tamsui River. The town filled with historical monuments and local savories will occupy your schedules. Tamsui Cultural Park, former British Merchant Warehouse, is right beside the Tamsui MRT Station. It was the warehouse to store tea related products by the British tea merchants. Later, bought by the Shell Oil Company, was expanded into four large warehouse and oil tanks. The warehouse once played a role in the global oil business. After the bombing by U.S. in 1944, the warehouse burned for three days was half destroyed and retired as a backup storage since. The property of the warehouse was kindly donated by the Shell Oil Company. In order to preserve the historical meaning of the building, the warehouse was carefully repaired. 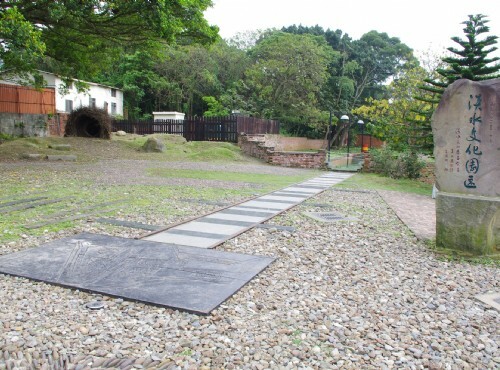 After the restoration and remodeling of the warehouse, Tamsui Cultural Park was established. Back to its old glory, relive after a hundred year, the warehouse is now a cultural park with historical exhibits. Tamsui Cultural Park, former British Merchant Warehouse, is right beside the Tamsui MRT Station. With meaningful historical background, the warehouse was restored into cultural park. It is one of the important historical monuments in Tamsui. Turn right onto Chungzhen E. Rd. Turn right on Bitou St.